(NASCAR Wire Service) BRISTOL, Tenn. – A week off and an extra day at Bristol did nothing to break Jimmie Johnson’s momentum. Grabbing the lead from Kevin Harvick on Lap 480 of 500 in Monday’s Food City 500 at Bristol Motor Speedway, Johnson stayed out front for the final 21 laps and beat Clint Bowyer to the finish line by 1.199 seconds. The checkered flag was Johnson’s second at the .533-mile short track, his second straight this season and the 82nd of his career in the Monster Energy NASCAR Cup Series, leaving him one victory behind Cale Yarborough for sixth on the career wins list – and two behind Darrell Waltrip and Bobby Allison. “That’s just mind-blowing,” said Johnson, who started 11th and led three times for 81 laps but didn’t get to the front for the first time until Lap 394. 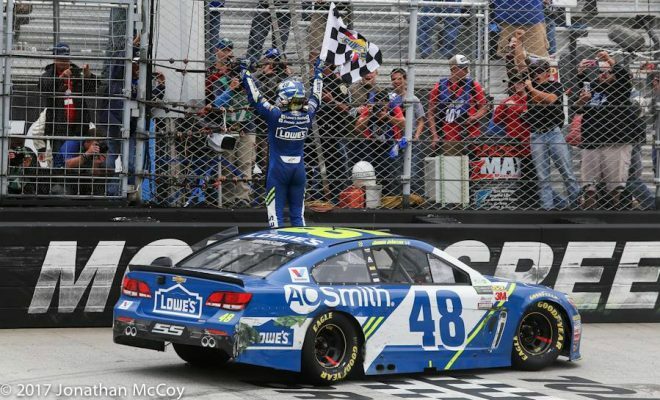 “I wouldn’t be here without (owner Rick) Hendrick’s support. Thanks to him and to Jeff Gordon for believing in me. 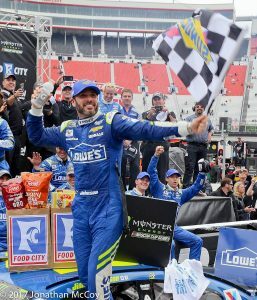 “For Hendrick Motorsports to make this job kind of a family environment for all of us to thrive in has been a perfect environment for me and (crew chief) Chad Knaus and for the consistent group of guys behind me through all these years has led to the environment to win 82 races, or whatever it is, which is just insane. Bowyer passed Harvick, his Stewart-Haas Racing teammate, on Lap 485 to post his best finish since running second at Richmond on April 27, 2013. Harvick held third, followed by Matt Kenseth and Joey Logano. Polesitter Kyle Larson came home sixth after leading the first 202 laps, but the driver of the No. 42 Chip Ganassi Racing Chevrolet had to recover from a Lap 421 penalty for speeding on pit road. The second-place run was bittersweet for Bowyer, who is looking for his first win since the fall Charlotte race in 2012. The driver of the No. 14 Stewart-Haas Ford had visions of victory after he passed Harvick, but he couldn’t run down the seven-time champion in the last 15 laps. Harvick got the lead by staying out on old tires when the rest of the contenders, except for Denny Hamlin, came to pit road under the final caution on Lap 465. Notes: Dale Earnhardt Jr. fell out of the race in 38th place when oil on his tires from a broken oil cooler launched his No. 88 Chevrolet into the Turn 1 wall after a restart on Lap 218… Kyle Busch, one of the pre-race favorites, blew right front tires on two separate occasions. The second instance knocked Busch out of the race on Lap 384, after he had climbed back into the top 10. He finished 35th… Sunoco Rookie of the Year contender Erik Jones ran in the top 10 all afternoon until a cut tire and subsequent contact from AJ Allmendinger’s Chevrolet damaged his No. 77 Toyota. Jones salvaged a 17th-place finish as the second car one lap down. Next Story → Handy: With Dale Earnhardt Jr Retiring After 2017 – Who Goes to the No. 88?